Volkswagen’s highly anticipated mini hot hatch is now officially available to lease – and you can find the very best personal lease deals by clicking here. It’s the smallest hot hatch in the company’s line-up and, thanks to its low kerb weight and 113bhp, it’s being heralded as the spiritual successor of the original Golf GTI Mk1. Externally, it’s set apart from the more standard supermini by a set of 17in alloy wheels, a lower stance and of course the famed red stripes surrounding the front grille – a nod to Golf GTIs of old if ever there was one. Gloss-black details and of course the GTI badge itself finish the look off. Creature comforts are present in spades in the cheeky new hot hatch, with Volkswagen’s Composition Colour radio system with five-inch colour screen, 4x20W output via six loudspeakers, Bluetooth telephone and audio connection, a USB interface, air conditioning, heated seats, electrically adjustable and heated wing mirrors, and front fog lights with static cornering lights all standard fit. Volkswagen Golf GTI at 40: what does the future hold? Similarities to its elder Golf relative continue in the power department. Its 1.0-litre turbocharged three cylinder produces 113bhp – that’s only around 5bhp more than a 1976 Golf GTI. The up! 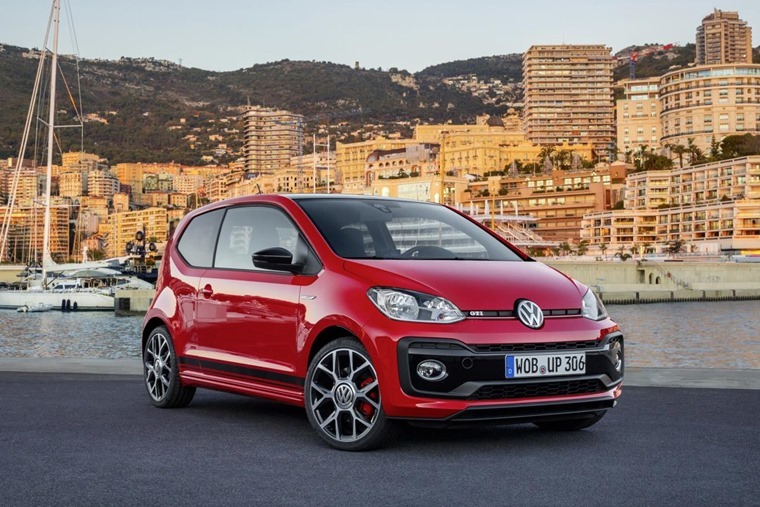 GTI is also one of the first Volkswagen cars to launch with a close-coupled petrol particulate filter. Its use reduces particulate emissions by up to 95%. After flowing through the turbocharger, the exhaust gas gets fed directly into the particulate filter, which, with its special coating, also works in parallel as a regular catalytic converter. The up! GTI is powered by the most potent petrol engine yet offered in the model range: a turbocharged, three cylinder, 1.0-litre TSI which offers up to 115 PS and up to 200 Nm of torque. This urge is channelled to the front wheels via a six-speed manual gearbox, and enables the charismatic newcomer to sprint from rest to 62 mph in 8.8 seconds and press on to a top speed of 122 mph. The original GTI, for example, could only muster zero to 62mph in 9 seconds, but it’s still heralded as one of the best cars ever made. So while it may have become faster with every generation, it also became heavier, removing some of the charm of the original. 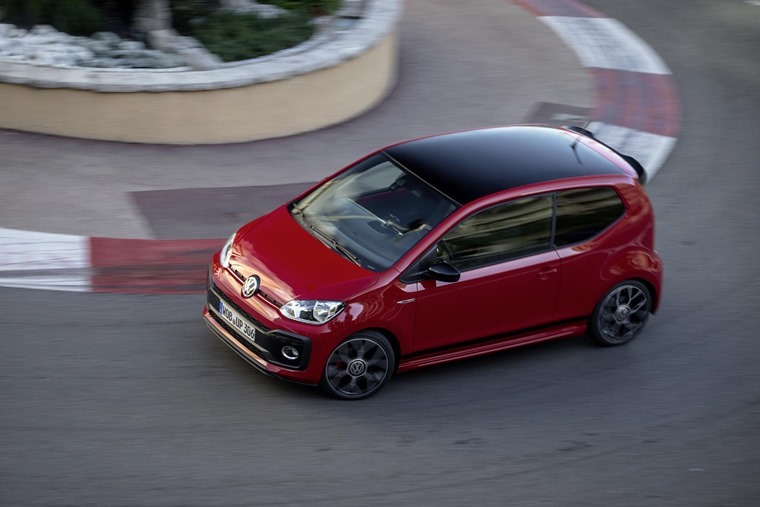 It looks like the new Up GTI could be the answer – it gets the go-kart like feel of an older hot hatch thanks to a lowered 15mm suspension, but keeps the impressive safety and emission standards of a brand-new car. 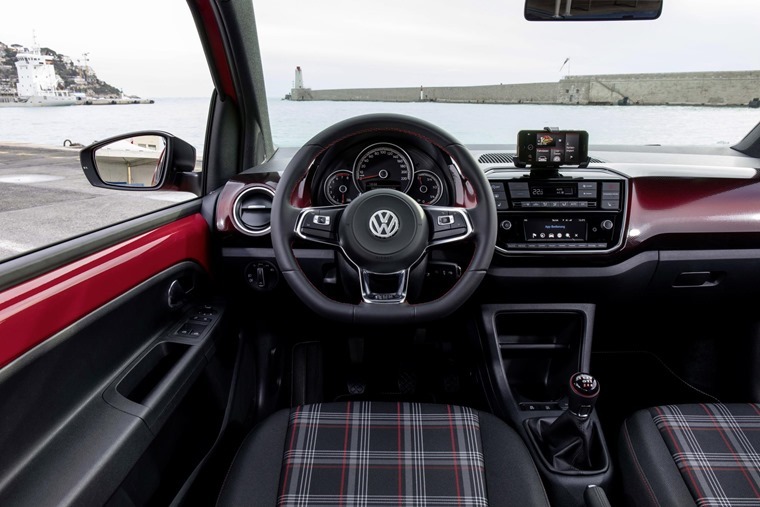 Welcoming the arrival of the newest member of the Volkswagen GTI clan Geraldine Ingham, head of marketing at Volkswagen UK, said: “The buzz around our newest GTI is remarkable, and rightly so. This is a wonderful little hot hatch that simply makes driving truly fun once again.